Sterility Testing by Direct Inoculation of Pharmaceuticals using Hardy Diagnostics Media per USP <71>. 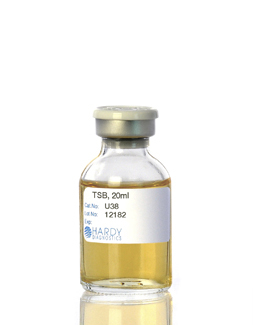 Drug solutions can be tested for sterility by direct inoculation into Tryptic Soy Broth (TSB) and Fluid Thioglycollate according to USP <71>. By incubating for 14 days, a lack of fungal, aerobic, and anaerobic bacterial contamination can be proven. Please consult USP <71> (Table II) to verify proper inoculum size and media volume. Recommended for use as a general purpose medium for the isolation and cultivation of a wide variety of bacteria and fungi. 100ml glass bottle with needle port septum, 100ml fill, 20/pk, Cat. no U46. Recommended for the cultivation of anaerobic microorganisms. 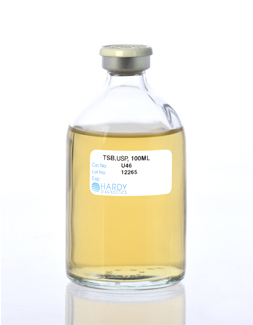 100ml glass bottle with needle port septum, 100ml fill, 20/pk, Cat. no. U84. Recommended for use as a general purpose medium for the isolation and cultivation of a wide variety of bacteria and fungi. 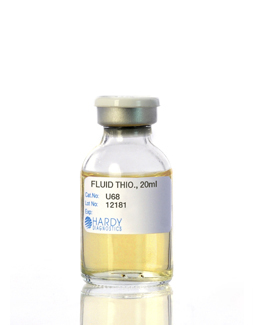 20ml glass bottle with needle port septum, 20ml fill, 50/pk, Cat. no U38. 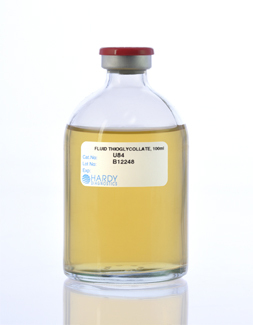 Recommended for the cultivation of anaerobic microorganisms. 20ml glass bottle with needle port septum, 20ml fill, 50/pk, Cat. no. U68. Thank you very much for your fast service.